Lately I have on a bit of a spaghetti squash kick. It all started when I learned that you can quickly and easily microwave spaghetti squash for a pasta replacement in under ten minutes. Before when spaghetti squash took close to an hour to roast, it only happened when I had planned ahead. But now? 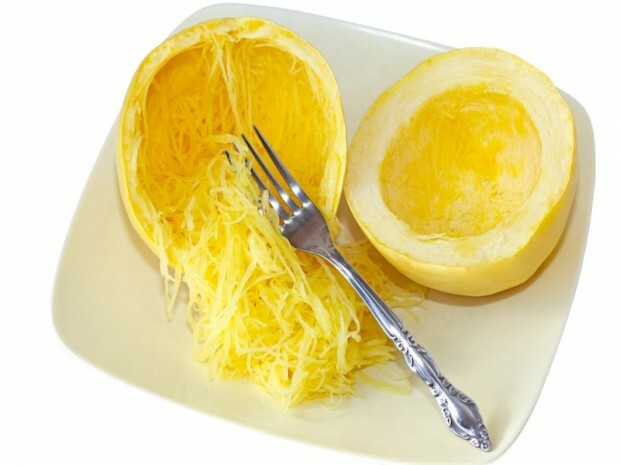 Spaghetti squash in under ten minutes. I am eating it all the time. My favorite way recently is with tomatoes, basil, and chicken for a spaghetti squash bruschetta. Recipe to come soon. Option 1: Take the spaghetti squash and carefully poke holes throughout the squash with a paring knife or other small knife. Then place the entire squash in the microwave for 10-12 minutes. Remove and carefully cut in half. Remove the seeds and scrape the contents out with a fork. Option 2: Cut the spaghetti squash in half and remove the seeds. Fill a container (big enough to fit the squash) with 1/2 inch of water and place the squash flesh side down in the container. Microwave for 4-5 minutes or until the flesh can easily be removed with a fork.